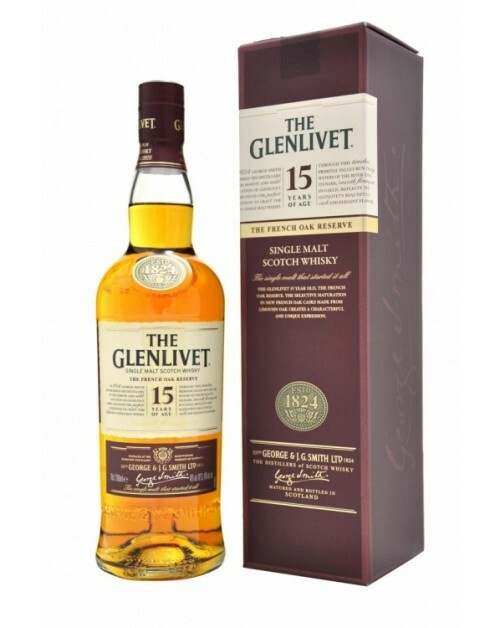 Glenlivet 15 Year Old French Oak Reserve Single Malt Whisky's distinctive character is the result of selective maturation; a proportion of the spirit is matured in French Oak casks but only for a limited period, so as not to overpower the final result. Limousin Oak, from the Dordogne region of France, allows the spirit to penetrate deep into the wood, imparting this expression's distinctive spiciness. Palate: Full and rich with an abundance of winter spice. Finish: Lingering with an almond and spice end.